The largest and oldest Jewish fraternal organization. It has (1902) a membership of about 30,000, divided into more than 330 lodges and 10 grand lodges, distributed over the United States, Germany, Rumania, Austria-Hungary, Egypt, and Palestine. It was founded at New York in 1843 by a number of German Jews, headed by Henry Jones, for the purpose of instilling the principles of morality among the followers of the Mosaic faith—uniting them on a platform upon which all could stand regardless of dogma and ceremonial custom—and of inculcating charity, benevolence, and brotherly love as the highest virtues. Political and religious discussions were to be barred forever in order that harmony and peace might be preserved in the deliberations of the Order. A constitution was adopted for the administration of the affairs of the Order; and in 1851, a sufficient number of lodges having been organized, the first grand lodge was established in the city of New York, and in the same year District Grand Lodge No. 2 was founded in the city of Cincinnati. The Order spread rapidly. 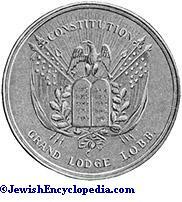 Lodges were formed in nearly all of the Eastern and Western states; so that in 1856 District Grand Lodge No. 3 was instituted, with its seat in Philadelphia, Pa. The supreme authority was placed in a central body, which met annually and was composed of one representative from each lodge. At the meeting of the supreme body in 1857 a membership of 2,889, with an accumulated capital of $78,000, was reported. At the same session the constitution was remodeled, giving it a more democratic and representative character. A new ritual, the work of Dr. David Einhorn, was also introduced in keeping with the progressive spirit of the age. B'nai B'rith Building, New York. A new era of development began in 1868, when, at a convention held in the city of New York, composed of representatives from each lodge, the present constitution was adopted. Meanwhile, three new grand lodges had been instituted: No. 4 in San Francisco, Cal. ; No. 5 in Baltimore, Md. ; and No. 6 in Chicago, Ill. The Order at that time numbered more than 20,000 members. Under the new constitution the supreme authority was placed in a president, to hold office for five years, and in an executive committee and a court of appeals, each of which was composed of one representative from each district, elected for five years. The first president was Julius Bien of New York, who had been the master-mind of the new constitution. He held the office until 1900, when he declined reelection on account of his advanced years; and Leo N. Levi of New York was unanimously chosen as his successor. 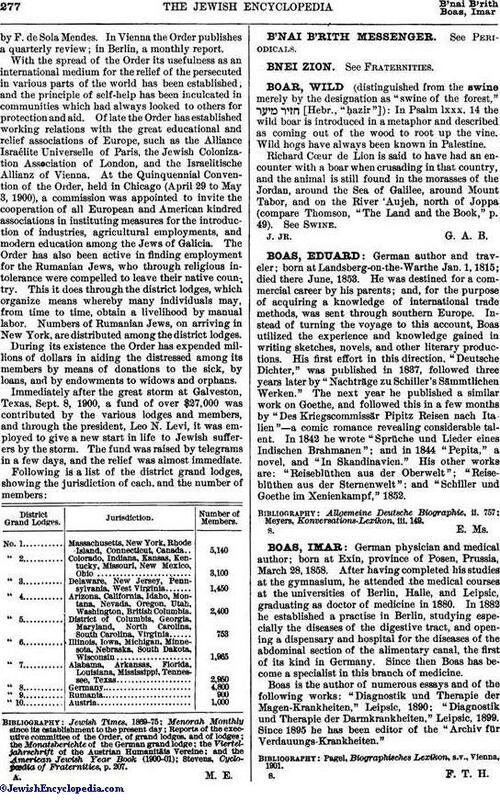 In 1873 another new grand lodge, No. 7, was added, which held jurisdiction over the Southern states. A new sphere opened for the Order in 1882, when Moritz Ellinger, as the deputy of the executive committee, instituted the first lodge in Berlin, Germany. 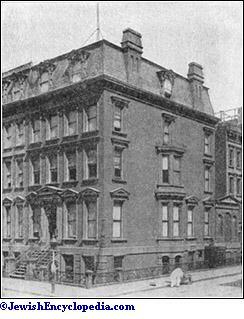 Meanwhile a number of institutions had arisen in the United States, founded and supported by the Order, such as the Orphan Asylum in Cleveland, housing nearly 1,000 inmates, supported by Districts 2, 6, and 7. Its erection was due to Benjamin F. Peixotto. Another institution is the Home for the Aged and Infirm at Yonkers, N. Y. The Atlanta Hebrew Orphan Asylum was established by District No. 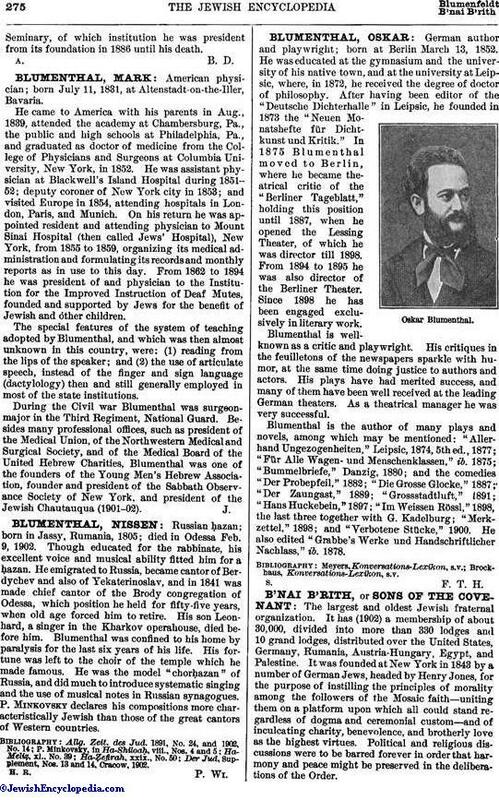 5, through the influence of Simon Wolf of Washington, D. C. The Jewish Widows' and Orphans' Home of New Orleans and the Touro Infirmary at the same place are supported by District No. 7. Finally, the Denver National Jewish Hospital for Consumptives was established by District No. 2. 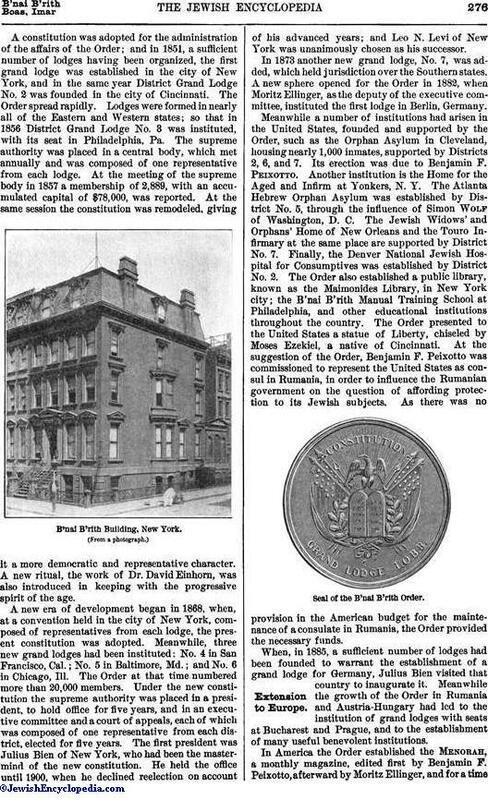 The Order also established a public library, known as the Maimonides Library, in New York city; the B'nai B'rith Manual Training School at Philadelphia, and other educational institutions throughout the country. The Order presented to the United States a statue of Liberty, chiseled by Moses Ezekiel, a native of Cincinnati. At the suggestion of the Order, Benjamin F. Peixotto was commissioned to represent the United States as consul in Rumania, in order to influence the Rumanian government on the question of affording protection to its Jewish subjects. As there was no provision in the American budget for the maintenance of a consulate in Rumania, the Order provided the necessary funds. Seal of the B'nai B'rith Order. In America the Order established the Menorah, a monthly magazine, edited first by Benjamin F. Peixotto, afterward by Moritz Ellinger, and for a timeby F. de Sola Mendes. In Vienna the Order publishes a quarterly review; in Berlin, a monthly report. Immediately after the great storm at Galveston, Texas, Sept. 8, 1900, a fund of over $27,000 was contributed by the various lodges and members, and through the president, Leo N. Levi, it was employed to give a new start in life to Jewish sufferers by the storm. The fund was raised by telegrams in a few days, and the relief was almost immediate. Stevens, Cyclopœdia of Fraternities, p. 207.